Listen in to Lee Baber and Derrall's webcast audio tutorial explaining how to set- up your Mac for broadcasting and recording using Nicecast, Skype, and Sound Preferences. Both usb headsets and usb mics are addressed. it's with fellow W.A. intern Pam Shoemaker, not the Skype Lady. for ­proper Nicecast settings for headphones and ignore mine. Watch mine if you want to see the overall process. It only took a brand new iMac and about 10 minutes of chatting with the fabulous Lee Baber and I was streaming and recording live on Sandbox B! Yahoo! 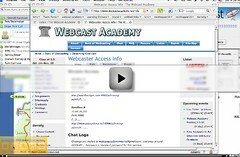 I can't believe how clean and simple webcasting with a mac is. All you need is Nicecast and Skype. Last week, I was having some trouble with Nicecast and Skype, and Lee was kind enough to take on my problem and help solve it. While I am still a little unsure of the complete technical description of the problem, Lee was able to walk me through my settings tonight and here are some things that we discovered.